Whether you wish to dress your device in full-grain European leather, Italian Rosewood, or precision engineered Kevlar, we have something for you. Great screen saver easy to apply. E-mails promptly answered and communication excellent. I first bought a screen protector for my iPod Touch and was impressed by the quality and service offered by the company. From then on, I always looked for MediaDevil products when it comes to device protection accessories. I also bought carrying cases for Macbook Pro 15” (back in 2014), MacBook Pro 13” (2017 model) MacBook Pro keyboard protector, and screen protectors for iPhone 6s & iPad Air 2. All my purchases were from Amazon UK so far. I was never disappointed from the above mentioned purchases, excellent quality and durable (the Macbook carrying case is 4 yrs old and is in like new condition, and the iPad Air 2 screen protector is still intact and in place after 4 yrs of usage). Moreover, MediaDevil products fit exactly for the intended device. Prices may seem a bit expensive when compared to generic brands, but I assure you that MediaDevil products are an excellent investment to protect your electronic devices, to keep them top notch and maintain a high resale vale for your device. They also come in excellent packaging, minimizing the risk of damage or bending during delivery. Oh and they include sweets with every purchase!! I always recommend MediaDevil to other people, as I know they never dissapoint with their products & services. Look no further, you will not be disappointed. This is a robust and beautifully-made case in real leather with a soft scratch-free inner, and is a perfect fit for my Lenovo tablet. MediaDevil offer a good choice of colours, and the discreet contrast piping and stitching give the case a real touch of class. The magnetic closure makes access quick and easy, but is strong enough to hold the tablet safely at all times - even during travel. I bought a similar case for an iPad Mini 3 years ago, and it is still in perfect condition despite daily use. The new case appears to be of exactly the same very high specification and quality. Both my orders were delivered very quickly (even in the lead-up to Christmas), and communications are always friendly and personal - but efficient. I am delighted with both orders, and have no hesitation in recommending both the specific product range and MediaDevil themselves. Any start up company who wants to understand excellent customer service buy a product from Mediadevil and copy thier process, excellent service. I’m one of those people who feels empty without music and I listen to all kinds of genres for an hour a day everyday during my commute to and from work. 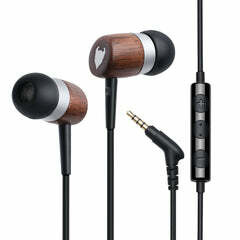 My previous earphones were Sennheiser Momentum In-Ear (£80). The ones before were Bose (£110 - model doesn’t exist anymore) and the ones before them were Beats (£100 - can’t remember which model). On average they last around 1 year before either breaking down, getting lost or boring me. 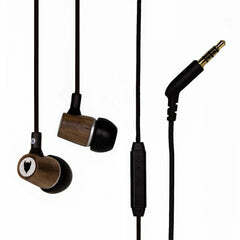 I can wholeheartedly say that the Nanene enhanced Media Devil earphones are better than all 3 imo. Sennheiser does not even compare to Media Devil (MD). Bose - great treble but poor bass. Also they had serious design faults - the cable broke down in 3 places, the clip kept getting stuck on my shirt collar etc. Beats - great bass but poor treble. And it leaked too much sound to the outside. Everyone was looking at me on the tube when I had them on. There was a massive smile on my face as soon as I put the MD ones on and started playing Muse. What a joy! Bass and treble equally great and fulfilling. No need to max the volume to hear the details of every note. I can go on and on but in short, Nanene works!! And MD has done an amazing job bringing this new tech together with a great design. The buds are super comfy and light. Noise cancelling is a lot better than I expected from a pair of earphones at this price range. I have already recommended these to colleagues and friends and they’ve ordered theirs for the new year. Your differentiator in a competitive market that relies on scale to deliver profits is the perception of ‘personal’ service. I’m involved in an IT startup in the Philippines and have sent them copies of all my dealings with you asking them to look and learn. Always a perfect fit, every time! I've been using Media Devil screen protectors for years, ever since the iPhone 4 to be precise. I've tried others in the market at about the same price point and higher, but Media Devil are consistently the best fit and are excellent value for money. Their customer service is also second to none. On one occasion I had a query and was phoned directly by Callum to answer my questions. I don't know any other company that has that much attention to customer satisfaction. They always will be my first stop for device accessories, their devotion to their customers and quality of service is outstanding. Still come out on top when vs a dozen others upto £150 mark. Sound. It's obviously a personal choice - one man's poison etc... I have and always will be on the lookout for good headphones. I have tried many many brands - Shure, Sennheiser, Focal, Ultimate Ears, B&O, Klipsch, Beyer (to name a few), and usually what is considered to be middle budget models of upto circa £150. I can't remember all the specific models but they weren't cheapo. The bottom line, particularly when you factor in price, the Mediadevils (I've had EB-01 and EB-03) are a clear winner. That's not to say that the rest are garbage (Ultimate Ears spring to mind for having terrible treble), they were mostly good in one or some ways and not so good in one or more. I have found both the Mediadevil EB-01 and EB-03 to possess the most pleasing overall sound for a widespread genre of musical and cinematic material. The bass is deep but controlled, and there's a good dollop of it (especially when you find decent matching isolating buds/tips). Proper bassheads might still need to look elsewhere but for most mortals there's plenty enough. The mids and highs are to my liking. Treble is not biting and tiring but sharp enough to reproduce tingling definition. I've never been much of a midrange range man (ie. I never really got on with speakers from Tannoy or Rogers) but that's not saying I like a V shaped EQ curve. I love vocal material but I just don't like it in my face. I would say that the Mediadevils managebto produce a very neutral and balanced midrange. There you have it. I felt it important to establish some context to my subjective views on the sound qualities of the Mediadevil headphones. I have not been able to compare EB-01 to EB-03 since my EB-01s broke (outside of warranty). 1. They're invisible - you don't really notice difference in the look and feel of the screen and navigation. 2. They're thin - you can use any heavy duty case (such as Griffin Survivor) with its own screen protector. No issues whatsoever. 3. They protect - the foil installed on my wife's iPhone SE took the hit, screen was not damaged (this accident resulted in the latest purchase). 4. They're easy to clean. 5. They come in pairs - two foils in each pack. 6. They're easy to apply - three iPads, 6-7 iPhones, only once I had to use the spare, and that was because I didn't clean the foil's foil off the dust thoroughly. Foils are sturdy, so they don't flip around due to statics and are not cling happy when you're applying them. Once they're applied, they stick and do not peel off. Bubbles are easy to push out. You get all tools you need for application and they ooze quality. These may sound obvious until you try applying cheap eBay-sourced foils as I had to for non-Apple devices (such as my Microsoft Lumia phone. Yes, I'm that guy...). I admit that Mediadevils are not cheap, but you get what you pay for and I never felt like not getting the value for the money. I don’t buy other brands for any of my iPad or iPhone needs. The screens are firm and flexible making application really easy. I usually have to find excuses to use the second one. My husband even had one on his phone when it was run over by a large truck. The frame of the phone was slightly twisted, and the screen protector was scratched and mangled. When we peeled it off the screen, it was pristine, not even a crack! I am a return customer because the product is great. It is a touch of class and I wouldn't trust anything else to comfify my phone! Great product this is my second get new every time I upgrade my iPhone. Always perfect fit and wear brilliantly. Would recommend it to everyone. This is not my first time to purchase this case.....nor will it be my last. An excellent product that not only looks very stylish but actually protects your iPad on top of that.....has saved my bacon on several occassions where the kids have dropped it. I have tried other brands in the past but nothing compares to the Media Devil product!! I would definitely recommend!! The only place we buy screen protectors because they are so good. I have bought MediaDevil products for a few years now, I keep coming back to them as they are great quality, easy to apply and definitely value for money! The customer service is always spot on too.